I love this scene from Only Fools and Horses of Trigger (played by Roger Lloyd Pack who sadly died recently) with his broom. Its only 24 seconds long so please have a gander if you haven't seen it before. He claims its the same broom even though its had several different handles and broom heads during its 10 year rein! So when Buddy's mini micro scooter needed its 4th brake and a new back tyre, I naturally compared it to Triggers broom. I did this on Twitter and being a canny blogger @ mini micro scooters whilst I was at it. I wasn't expecting too much of a response but thankfully the mini micro tweeter had a sense of humour. Now this isn't to say I was complaining about it - I love these scooters so I do. They are by far and above the best on the market - any other scooter is inferior in my eyes. All (three at the last count) of my children have these scooters - the eldest two having the maxi ones. Buddy has been zipping around on his since he was 18 months old - he's 4 in May. It has done some serious mileage and travelled to France (another great thing is you can detach the handle so it lies flat in the boot/rooftop box) and the constant braking and what not has meant it has needed replacement parts - mainly the brake. I was never a fan of the buggy board - call me old fashioned but I think a child needs to learn how to walk and longer than a few yards before being popped back into the car. If your child has a scooter you can walk at an adult like pace and everyone's a winner. 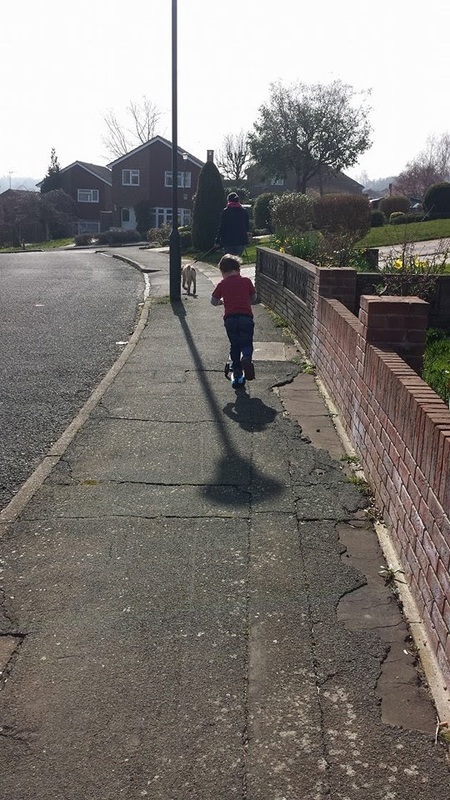 What I love most is how easy children are able to master them - they just tilt the handle to the side to steer and the braking system is also easy to use. My little fella had mastered it in a matter of months. Admittedly he used his feet in the beginning but soon had the dexterity of a contestant on the Krypton Factor to manoeuvre his foot to the back to stop. May I suggest a mini micro scooter to be named "the masters edition" or something yoda like? Okay am getting a bit carried away now! The box deserves a picture possibly more than the scooter - funky monkey - who wouldn't want to un wrap this? Give the marketing guru a pay rise! So we're all clear then that I am a big fan. Not only that I have been a blogger for two and a half years now and I have always wanted one of these bad boys to review. 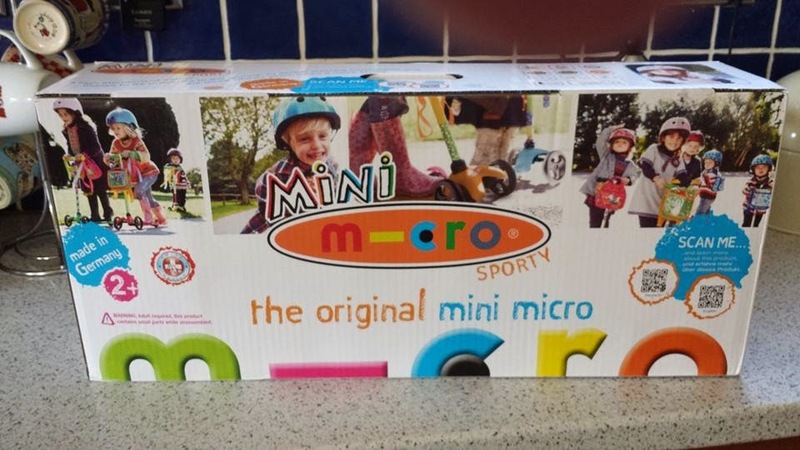 I have been nominated for blog awards, been featured on mumsnet, featured in Britmums round ups but for me, the ultimate blogging pinnacle would be receiving (without parting with cash - of which I have three times) a mini micro scooter to review. Well my friends the time has come....I have reached the dizzy heights of blogging.....and give you...the mini micro scooter!! Tah dah.. The worn out V the shiny spangly number. I have to say Buddy has discarded his old one with not so much as a fond farewell. It has been confined to ebay with its new brake, new tyre and my rather helpful description that you can buy a 'replacement deck' in their spare parts section (he'd taken a little chunk out when he bumped into the pavement). That's another thing - you can go mini micro crazy with accessories and what not too. So thank you mini micro scooters for making Buddy a very happy little boy and helping his mother reach the pinnacle of her blogging career! It was thanks to your recommendation that we got CK a micro scooter. It's his favourite thing too. Awesome invention (by the Swiss, would you believe). Bring on the Badge Wars!